…well, or just flowers with violet-ish hues. hehe. The alphabetical thing is tough sometimes! May just give it the heave-ho once I’m done with Z. Happy Monday to all, and I hope you find some time to set your inner creator free today! Peace. Thanks! I’m really enjoying working with flowers. Very refreshing and summery image. I like all the white ground in contrast with the delicate flowers. Thank you. I do like lots of white too. I need to remember to save the white. I think sometimes I just keep painting when I should stop. Knowing when to stop is hard…I think we all go too far sometimes. Haha, with everything! Balance is the key to it all. If only I could find the vendor so I could stock up! 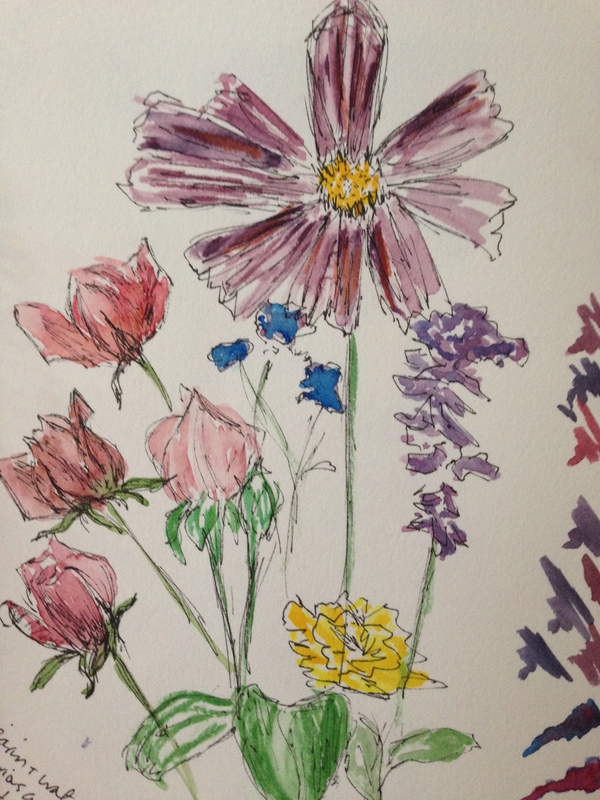 …how I enjoy your flower paintings! Wow, thank you, Lance! You’re a kind soul. Beautiful, authentic 😊 and uniquely Laura! Thanks for the beauty on a Monday morning. Hey – I was starting to get worried about you LOL! Hey Jodi, thank you so much. Penny is sick and I’m waiting to hear from the vet. She was worrying me much more yesterday than today, but I’m still concerned, so it’s been a bit crazier than normal around here. Sorry to hear about Penny!! I completely understand – and certainly don’t want to pressure you about WP! 🙂 Glad to hear from you and take care of Penny! Hugs! No worries – I was worried about you and Jill, actually, that you’d be wondering where I was lol. “You know you’re online too much when….” hehe. Thanks, Jodi. Wow, thanks, Kirk. I’m definitely trying! 😀 Roses are tough, but the buds are easier. Lovely bouquet today Laura. Have a beautiful day. You’re inspiring me to add some colors to my inks! This is so pretty! Aw, thanks Teresa! It really is fun. Would make beautiful note cards! Penny is sick, Jill, but we’ll see how it goes. I have a call in to the vet. Prayers appreciated! Thanks for your concern. Delightful, whimsical and lovely colors! Aww….thanks, BB. (((((((((BB)))))))))) You know when you have one of those days….that turns into one of those weeks? Like that. Thanks.